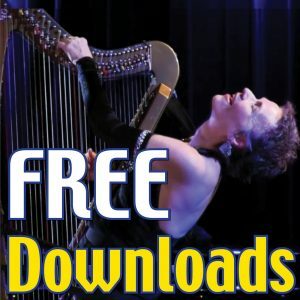 I opened my email inbox over the weekend and found this email from Susan Carol, a harpist who’d joined my new “3-Chord Magic” class – the first class in the “Sing & Play the Harp” Immersion Series at Hip Harp Academy. This was huge for me, because …I can get in the way of my own learning potential by trying to achieve everything at once! In that same vein, you introduced “feeling” versus “complexity/virtuosity,” and NOT going to the “criticism” place – our inner judge who’s so quick to condemn us! Thank you for giving me/us permission to “bring it down” and relax – FEEL the patterns in our hands and hearts. The power of these 1-4-5 chords is also the heart of much of our hymnody. I’m working on developing that numbering system for hymns, because my daily bedside practice involves a lot of that genre. In this course, I discovered I really had to keep stepping back from going too fast, adding more before I was ready. It was an “aha” moment for me to realize this is a fundamental problem for me with trying to sing with the harp. I’m a lifelong-singer who came to the harp later in my career. However, I’ve found that I’m hiding behind “playing the harp,” and my voice has taken a backseat to the instrument. I’ve felt strongly compelled to sing more to/with my patients/residents, and been trying to figure out how to incorporate that into my bedside practice. I love how you illuminated that our instrument (harp) is such a beautiful “partner,” with sustain that allows – actually invites – simplicity, with even a single ringing chord, while we sing with our hearts on a very soulful passage… Brilliant! Finally, you asked about the latest demonstration videos for the individual songs. I’ve only gotten to view a couple so far, but they are amazing – LOVE them!!! First, it’s so beautiful to listen and watch you create artistry with your voice and harp. Next, you provide some excellent examples, and I think you’re casting vision of what CAN be done. Demonstrations that can appeal to multiple levels of musicians. PLUS, you gave the most beautiful inspiration on “Mr Rabbit, Mr Rabbit.” I cried, in a good way. I so value your passion, and the love and soul with which you teach and share your art. You really communicate far beyond the songs – you connect, and you convey the meaning and spirits of people who’ve created and sung these songs before us. I feel this way about hymns. I’m a professional church vocalist who became a therapeutic musician, and I’ve been singing hymns with and for others for years. Isn’t it powerful to witness how these songs touch people, in profound times in their lives?! This is a huge Thank You for giving so much in your training. It is incredibly valuable! If you play the harp … raise your voice and sing. 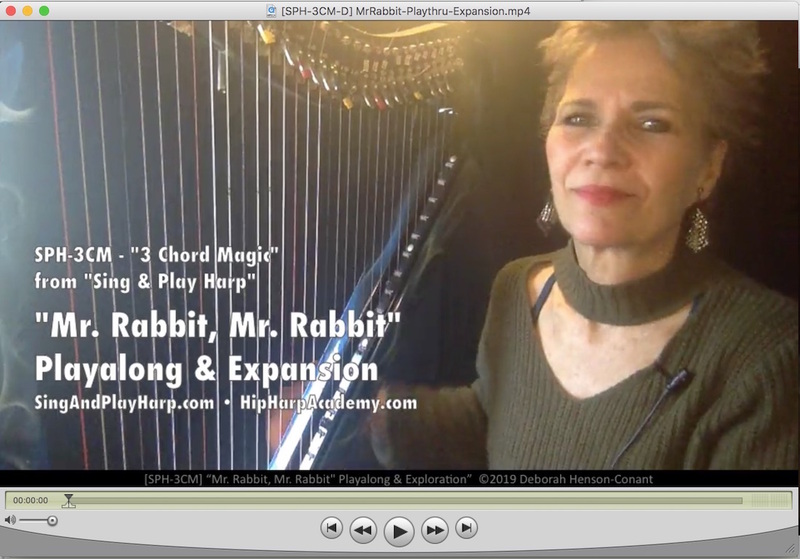 Jump into “Sing & Play Harp: 3 Chord Magic”. It’s an Immersion training for harpists from Fledgling to Advanced level, and includes a 2.5-hour basic training plus warmups with over 2 dozen picking patterns, training in how to shift tunes from key to key, how to sing while you play – and a dozen trainings in specific songs. You WILL be singing and playing when you’re even just half-way through this class!